Gorgeous heart-shaped soaps brighten up any bathroom or make a delightful gift. 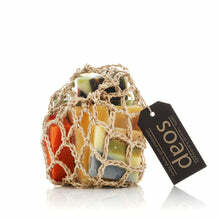 Here we pack four different coloured and scented soaps together, all natural of course! Colours shown in the photo are only indicative - you may get other colours. If you have a special colour preference, please leave a comment at checkout. Our soap hearts are made with premium plant oils including olive oil, shea butter, coconut oil, macadamia oil, rice bran oil, avocado oil, cocoa butter, mango butter and pure essential oils. We use clay and plant extracts (chlorophyll for green, paprika for orange, annatto for yellow) for the natural colours.